Ouch! this for me is the argument for separate bank accounts. in the vicinity of a pub called the (i forget the name) Arms, near the Romford Road & Upton Lane crossroads in East London, London. let it be known for the record that that is a Ugandan neighbourhood. eish! so you are still alive! kyokka Savage you can spoil a good story!! It even has a fake video of alleged burst up of husband and Emily's best friend leaving a motel. They had executed their idea very well until they decided to put up similar billboards in Los Angeles and Chicago a few days later. 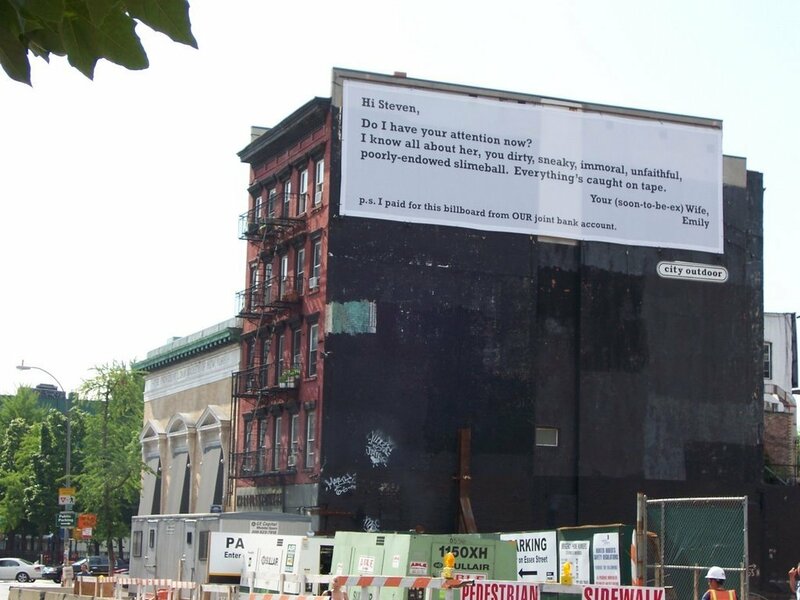 that's when people realised that possibly it was a marketing ploy, because poor Emily wouldn't have thought about putting a billboard supposedly to embarass her soon to be ex in L.A and Chicago where possibly no one knows him. while i disclaim any and all complicity in perpetuating whatsoever falsehoods as may be ascribed to my inadvertent spread of what on the surface was patently truthful information, i shall refrain from avarice unto your person as sought by your nefarious insinuation of such aforementioned complicity on my part in the dastardly deed under consideration! @Degstar-And you just had to get all philosophical on me. Didn't you? dang savage! u know everything wierd and inconsequential, eh?? Eh Deg! That was hilarious a response to Savage! Sounds like an excerpt from Robert Louis Stevenson' "Dr Jykll & Mr. Hyde" or like Bernard Shaw in one of his ancient, critic reviews. Welcome back meanwhile!! @JKB-I don't think I got pawned because past knowing that is not a Ugandan neighborhood, I know for sure that it is New York. I have a hunch you missed the whole thing including the billboard. (Click the picture to enlarge). Savage, I still don't get what the billboard is campaigning. If it's for a court TV show, how is that message advertising the show? 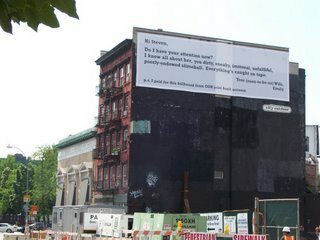 @anonymous- The blog entries accompnying the billboard correspond to some of the shows plotlines. Basically the show is called Parco P.I. and is about a private investigator. And from the blog, Emily suspects her husband is cheating and she hires a private investigator. Here is a synopsis for an episode entitled "getting even." Vinny's latest client is a woman whose husband is not only cheating on her, he's stealing money from their jointly-owned real estate company. He has to figure out what her husband's true assets are. After a little investigation, Vinny discovers that the husband actually has two real estate companies. It's kind of like his girlfriend – his wife isn't supposed to know. Parco's plan? Set up a sting operation with the whole Parco family posing as the staff at a hair salon looking for a new space to rent. Savage, you spend way too much time on the net. @Jay-yeah. I am a mouse potato. Savage, I am with Jay and Inky Ink. What on the internet don't you know?